It is pretty common knowledge that one of the more difficult pests to deal with is bed bugs. By the time they are spotted, there is a good chance that they have already exploded in population. 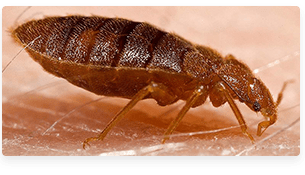 Luckily, our technicians have the experience and knowledge to think like a bed bug and know exactly where they are hiding out. Note: Heat and steam bed bug treatments by themselves do not give you a residual to fight eggs/nymphs and impregnated adults. Our specialists will advise a custom plan according to your situation. We guarantee you a house that is completely bed bug-free by the time we are done. If some of those pests managed to survive past our initial assault, we will come back and treat your home again absolutely free. Bed bugs are small parasites with 15 species in North America alone. They can range in size from 1mm (nymph) to 5mm (adult) long. Bed bugs have three life stages; egg, nymph, and adult. They feed on blood, and molt as they grow through their stages. Bed bugs are often found in groups. 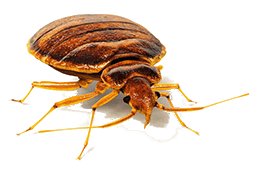 It is common to find bed bugs hiding in the seams of mattresses or other areas that allow easy access to hosts during the night, yet leave them undisturbed during the day. Other common hiding places include pieces of furniture such as dressers, nightstands, or armoires. Bed bugs are most commonly active at night. Eggs - Small but visible egg, 2 grains of salt for scale. Nymph - 1 mm in size, poppy seed for scale. Adults – 5 mm in size, apple seed for scale. Bed bugs enter the home after latching on to someone or something, e.g., purses, bags, luggage, clothing, etc. They come from other infested spaces such as houses and apartments, hotels, theaters, second-hand furniture, etc. Once they arrive to their new residence, they are quick to hide and have the ability to multiply extremely fast. Bed bugs are more common in environments with multiple people living under the same roof. The more people in and out of a residence, the more ways bed bugs can potentially enter the household. Bed bugs have never been suspected hosts of human disease, even though they are parasitic. 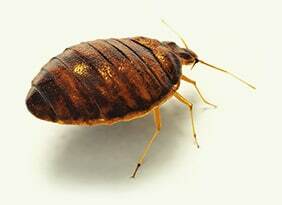 Bed Bugs have a jaw that allows for penetration of human skin and feed for only a few minutes at a time. It is common for these bites to produce a rash-like condition that may itch or cause discomfort. The psychological toll can also disrupt sleep habits and lead to a stressful environment for those dealing with infestations. Technicians should have experience with bed bug management.